This is a follow up to the blog-post, which was published on roape.net on 31 May, 2017, in which we showed that poverty increased by between 5 and 7 percentage points between 2010 and 2014 in Rwanda, even as the government claims it decreased by 6 percentage points. The blogpost concluded that the information emerging from the household survey data appeared to be incompatible with the official figures on economic growth, and invited researchers to more closely scrutinize the data coming out of the National Institute of Statistics of Rwanda (NISR). Indeed, with agriculture accounting for more than one third of GDP and two thirds of the workforce, it is difficult to imagine a scenario in which total GDP growth could average between 6% and 8% annual growth, while incomes in the agricultural sector appear to be decreasing for a substantial proportion of farmers. This blogpost tries to substantiate those claims using the NISR’s Integrated Household Living Conditions Survey (EICV) data as well as looking at more recent trends in relevant macroeconomic variables. According to economic theory, per capita household consumption measured from National Account Statistics (NAS) should be equivalent to average income or consumption measured from Household Surveys (HHS). In practice, this is rarely the case because of measurement errors. For instance, households tend to deliberately under-report earnings, while NAS have trouble capturing illicit and informal economic activity (read Ken Simler’s 2008 paper on this theme). Even when there are differences in levels of income estimated by the two methods, however, Martin Ravallion (2003) concludes that, “NAS consumption growth rate is an unbiased predictor of the HHS consumption growth rate.” Furthermore, he finds that NAS/HHS estimates should converge over time as the economy develops and becomes more formalized. In Rwanda, household final consumption represents around 80% of total GDP (varying from 79.8% in 2005 to 79.6% in 2015, down from 86.3% in 2000), meaning that growth in average consumption measured from NAS or HHS should be a good proxy for growth in GDP per capita. In figure 1 below, we show the evolution of average household consumption between 2000 and 2013 in Rwanda, as estimated from the EICV datasets and nominal GDP per capita in local currency units, as reported in the World Bank’s World Development Indicators databank. 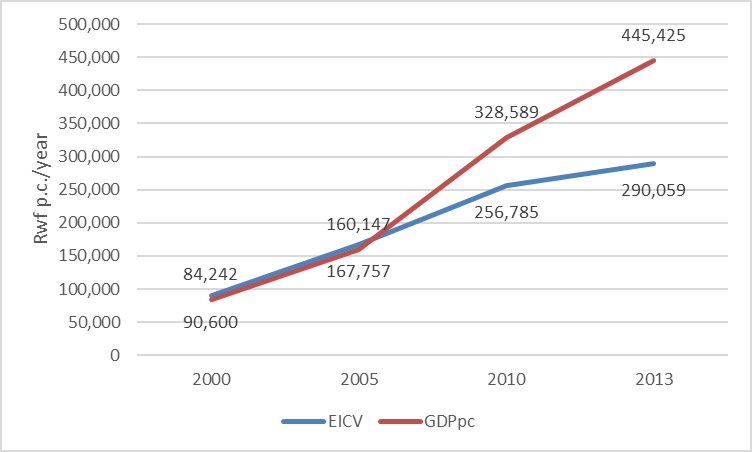 As the graph shows, estimates of average income/consumption from the EICV and national accounts were almost identical in 2000 and 2005, and started to grow apart thereafter. By 2013, the national account estimate was more than 50% higher than the average consumption estimated from the EICV. 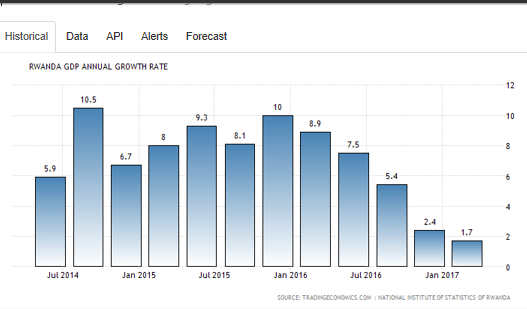 This does not constitute incontrovertible proof that GDP growth rates have been over-estimated in Rwanda, since there are different factors listed above that could explain such discrepancies. 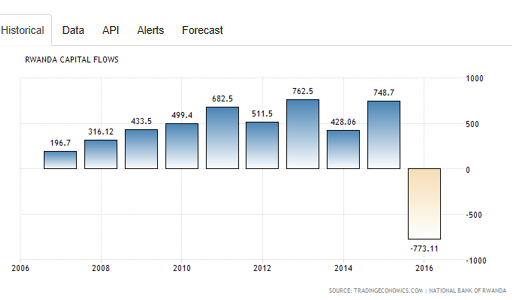 But it does strongly suggest that something is amiss in Rwanda’s GDP growth figures. At the very least, it does raise serious questions about the reliability of national account statistics, which the government and donors rely on to claim the success of their policies. 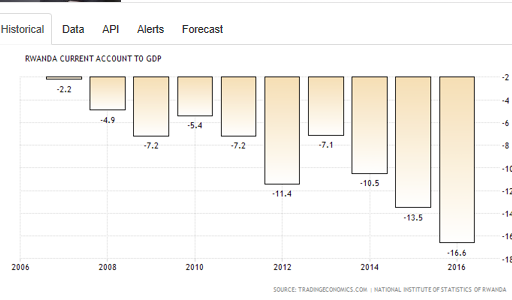 As mentioned in our previous blogpost, GDP figures are easier to manipulate than household survey data, as the Greek case famously showed a few years back. Even if we were to conclude that growth data have not been manipulated in the past, there are reasons to be concerned about the current performance of the Rwandan economy. The most recent growth data coming out of Rwanda shows that economic growth slowed to its lowest level since 2002 (1.7%) in the first quarter of 2017. With a population growth rate of 3% per year, this means that Rwanda’s GDP per capita growth rate is now effectively negative, even according to the NISR’s own estimates (see figure 2 below). This should come as no surprise to those who have paid attention to the facts behind the dazzling numbers that Rwanda and its donors like to boast about. While there has been undeniable progress since the war, much of the improvements we see in Kigali today are cosmetic and driven by the government’s obsession to portray an image of success rather than to lay the foundations of lasting economic growth. 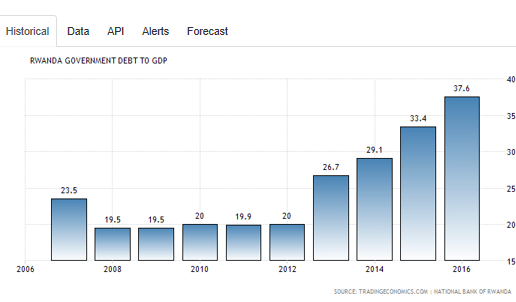 As we mentioned in the previous blogpost, much of the investments have been financed with public debt, leading to a surge in external debt levels (see figure 3 – remember that actual debt to GDP ratios may be even higher, if GDP has been overestimated as our analysis suggests). This would all be fine, if the investments had been strategically targeted at growth areas aimed at leapfrogging development Korean style. 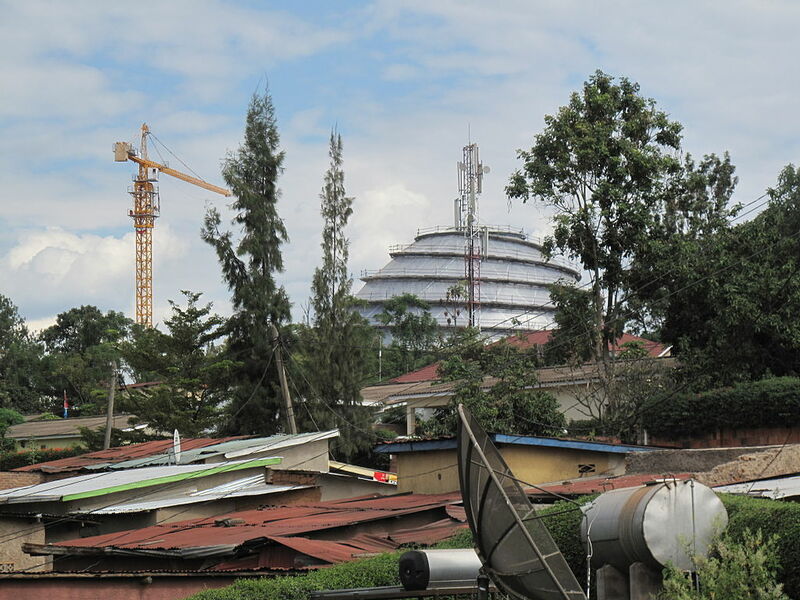 But to date, the vast majority of investments have gone into cosmetic – and crucially loss-making – prestige projects, such as the Kigali Convention Centre, Rwanda Air, Kigali skyscrapers and luxury housing units for the non-existent Rwandan upper-middle class. Even if these investments were not making a loss, this would arguably be a questionable use of public resources, since they are all highly regressive and aimed at subsidizing the super-rich or foreign clients. Rather than enabling economic development, these projects cost the Rwandan taxpayer dearly in running costs and take away precious resources from more pressing areas of development, such as the agricultural sector. The result of these irresponsible investments is beginning to be felt. For the first time in recent years, capital account flows to Rwanda were negative by a large margin in 2016, indicating that investors may be starting to put their assets abroad (see figure 4 below). The situation is likely to get worse, not better, over the coming years as even larger prestige projects come online and existing ones start accumulating more losses. The East African reported on 3 July that “Rwanda’s foreign reserves are expected to fall below the East African Community’s convergence criterion of four months [of imports] in the coming year” and may fall below IMF’s critical threshold of three months of imports. 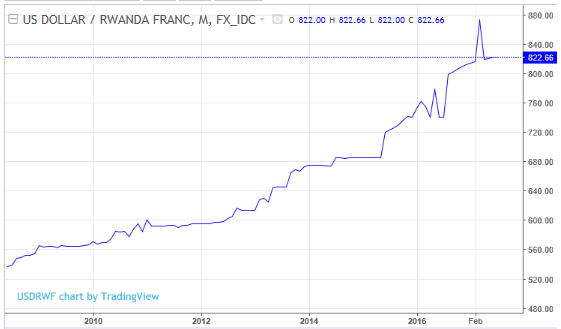 The conclusion of this brief analysis is that if there ever was a Rwandan economic miracle it has probably fizzled out some time ago and is likely to come crashing down very soon. At the very least, the data shows that the development strategy adopted by the Rwandan government is risky in the extreme, bordering on reckless. The closest example we can find in recent history of similar policies is Mobutu’s Zaire that squandered the country’s resources on space projects, nuclear power plants and a Concord airplane. As outlandish as they seem today, these projects also helped to give Mobutu an image of success up until the 1970s (remember the Rumble in the Jungle?) But Rwanda’s PR machine has even surpassed Mobutu’s, having managed to keep the narrative of success going for all these years even as evidence to the contrary has been in plain sight, or just below the surface waiting to be scratched. Even today, there is not a single article in the press (even the critical ones) that does not mention Rwanda’s alleged economic success, and its low levels of corruption – forgetting to mention that close associates of Kagame appeared in the Panama Papers last year and a transparency international coordinator was assassinated. The do-files required to estimate average household consumption are the same ones that were published in the previous blogpost. Once the do-file has run its course, you simply need to run the following command to obtain average household consumption: svy: mean adtot. For EICV2 use this do-file (click here to download the file). For EICV1, we used the figures in Table 2, page 13 in: McKay, A. (2015). The recent evolution of consumption poverty in Rwanda (No. 2015/125). WIDER Working Paper. Reports on Rwanda transformation aren’t provided by the government of Rwanda,but rather IMF, WB and oher international actors. The first point of additional information is that the World Bank’s WDI databank contains official estimates of mean household consumption estimated from the two most recent EICV surveys (see http://databank.worldbank.org/data/reports.aspx?source=world-development-indicators). These official statistics confirm that average consumption decreased between 2010 and 2013 at an annual rate of -0.6% after adjusting for inflation (survey mean consumption or income per capita, total population, 2011 PPP $ per day). This is consistent with our estimates presented above and with our earlier finding that poverty rates had increased in Rwanda during this period. Crucially these are official statistics published by the World Bank based on data provided by NISR. The WDI database also confirms the big discrepancy between NAS and HHS growth estimates, since it estimates the average annual GDP per capita growth rate during this period to be 4.6%. By comparison, the gap between NAS and HHS growth rates is around 1.3 percentage points in Tanzania and Uganda. – Hypothesis 1: Both NAS and HHS figures are correct. In this scenario, the discrepancies between NAS and HHS figures would be due to differences in definition, coverage, etc. between the two measures. For instance, GDP figures include government spending and investments, which may not be reflected in household consumption. This hypothesis would seem plausible, given the type of investments identified above (debt-financed, loss-making prestige and luxury projects), which would not typically be expected to benefit average households. As such, it would strengthen concerns about the regressive and unsustainable nature of government expenditures in Rwanda. However, if this hypothesis were correct, we should expect to find a decrease in final household consumption estimated from the NAS, which is not the case (Household final consumption expenditure grew by 6.5% per year according to the WDI databank). – Hypothesis 2: NAS figures are correct but HHS figures under-estimate household consumption. This might for instance be the case if, as it often happens, rich households systematically under-report income/consumption or refuse to take part in the survey. In this scenario, GDP per capita would indeed have grown at 4.5%, but this growth has disproportionately benefitted rich urban households that are not adequately captured by the HHS. Such an explanation would be good news for growth but very bad news for inequality, since it would mean that the totality of Rwanda’s economic growth in recent years has gone to rich households, while average incomes for the rest of the population would have deteriorated. This hypothesis, however, seems to be incompatible with the claimed increase in agricultural value added (+3.9% annually between 2010 ad 2013), since this is the sector that is known to have experienced serious problems in recent years. Furthermore NAS figures also claim an increase in manufacturing (+6.4%/ year) and services (+8.3%/ year), which doesn’t leave much room to explain the decreasing consumption levels. This leaves us with a third hypothesis. – Hypothesis 3: HHS figures are correct but NAS figures over-estimate GDP pc growth. This is the so-called “manipulation” hypothesis. This is obviously the most controversial and difficult to prove hypothesis, so we leave it open for other researchers to explore through more robust methods, if possible. Given what we now know about poverty numbers, as well as recent reports of possible manipulation in the health sector (http://www.dailymail.co.uk/news/article-4721282/Despot-dictator-Rwanda-sent-hitmen-UK-kill-rivals.html?ITO=1490), this is a hypothesis that should be taken seriously. Finally, we should point out that neither of the above stated hypotheses invalidate the second main conclusion of the blogpost, which concerned the unsustainability of the “development” strategy adopted by GoR. Even if we were to conclude after further analysis that Rwandan growth rates have been as high as claimed by the government, it would not mean that they still are high nor that they will remain high in coming years. and found almost the same results as portrayed in your first graph . So can you explain the reason behind the discrepancy found in those other countries data?. Thank you for your contribution to this important discussion. Unlike, the previous blogpost on poverty, this one does not provide any answers. It just points to anomalies that would require further inquiry. Consequently, we hope that other researchers will be able to chip in to provide more exhaustive and robust explanations. In the meantime, please find below some preliminary responses to your question: using the same data source as before (WDI databank), we looked into the countries you mentioned. For all countries, with the partial exception of Mauritius, we found that HHS household consumption growth gave a reasonably accurate prediction of NAS household consumption growth (less than 1 percentage point discrepancy). This is consistent with theory and with experience elsewhere. The relation with GDP per capita growth is, indeed, more sketchy, which will need to be explained on a case by case basis by changes in investment, government consumption, etc. in each of these countries (this has probably already been looked into by experts). In Rwanda, the main issue is the discrepancy between growth in household consumption in the NAS and HHS, which is quite different from the cases mentioned above, and is not consistent with theory nor with other countries experience, nor even with Rwanda’s own experience before 2005. Furthermore, for all the countries you mention, including Mauritius, we found that changes in NAS consumption had the same sign as changes as changes in HHS consumption, meaning that NAS was at least able to accurately predict whether household consumption improved or deteriorated during the period. This is consistent with the finding in Ravallion (2003) that in the vast majority of countries, NAS accurately predicted the direction, if not the level of change in household consumption. This is not the case in Rwanda, where HHS household consumption decreased by 0.6% per year between 2010 and 2013, whereas NAS household consumption increased by 6.5%. Furthermore, please note, that after discounting population growth, the gap between HHS and NAS growth in Mauritius is just 1.5 percentage points, which is 3 times less than in Rwanda (population growth during the period was 2.6% in Rwanda according to WDI). In short, the Rwandan GDP mystery remains complete. Even if it turns out that NAS growth rates have not been over-estimated in Rwanda, the alternative explanations do raise serious questions about the quality and sustainability of economic growth in Rwanda: Hypothesis 1: Growth driven by government led (and debt-financed) expenditures on prestige projects that do not translate into improved well-being for the population; Hypothesis 2: Growth concentrated in the rich urban elites that are not captured by the HHS, while living standards for the rest of the population are decreasing. *No HHS consumption data found in WDI databank, please provide alternative source if available. The most notable feature of the GDP figures is that final household consumption is reported to have decreased by 9% year on year, even as total GDP is said to have grown by 4%. A 9% decrease in total household consumption (meaning an 11-12% decrease in per capita consumption, assuming 2-3% population growth) would indicate a catastrophic deterioration in household welfare in the midst of supposed economic growth. This calls for a thorough explanation from NISR as to what is causing this very worrying and apparently contradictory (not to say implausible) situation. An alternative explanation for this sudden and unexplained decrease in final household consumption is that NISR has been made aware of the discrepancies revealed in this blogpost between household consumption estimates provided by the NAS and those provided by HHS, and is now trying to bring household consumption figures in the NAS down artificially to the levels estimated in HHS so as to make its GDP growth estimates more credible. However, the magnitude and apparently contradictory and unexplained nature of this sudden contraction in final household consumption is highly suspicious. These new official figures thus strengthen our concerns regarding the credibility and reliability of official NAS data in Rwanda. The only way to restore credibility in these figures would be for NISR to publish all of its raw data and calculations and allow academics or other independent experts to independently verify the numbers. Donors, the IMF and the World Bank should stop quoting official GDP figures coming out of Rwandan until they have been able to independently verify the government’s claims.. The problem with western critics is they always uses western lenses while assessing situations in Rwanda. Dear the connoisseur, can you explain how can someone survive on less than a dollar? People don’t even try their best. They just assume they know everything. Why do you assume I’m western? And your name doesn’t sound particularly Rwandan to me, or is that your real name? Monsieur Pierre, nobody benefits from personal attacks. We are trying to learn here and you are not making that easy for us. The researchers make a very compelling, figures-backed case and if you are genuine, please refute the figures and methodology.